ennE – how was it? varai kudai thOL kAmbAga Anirai kAththu – you held the mountain (gOvardhana) which could not be shaken by anything, as an umbrella, keeping your shoulder as the handle for that mountain, in order to protect cows. Ayar nirai vidai Ezh seRRavARu ennE – why did you kill the seven huge bulls which came as a hurdle to your marrying nappinnai pirAtti [incarnation of nILA dhEvi during krishNAvathAram]? Was it to demonstrate your omnipotent nature? It was to offer yourself to your followers, who have no other refuge, by removing their enemies. 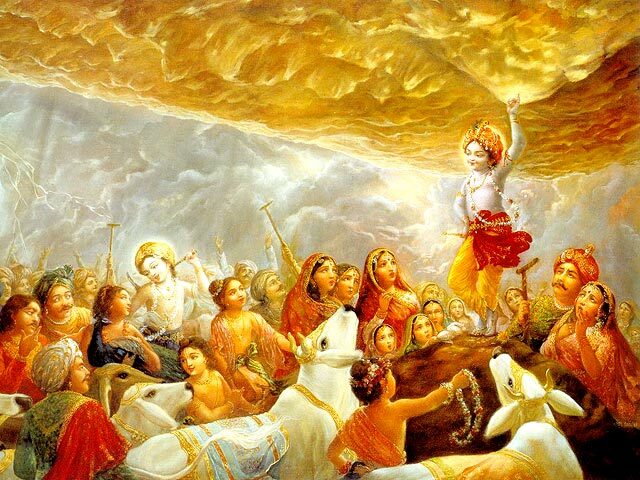 Instead of hurling your divine disc at indhra [who ordained hailstorm to trouble the cowherds] you protected the cows and cowherds by lifting the gOvardhana hill, hurting your shoulders! uravudaiya nIr AzhiyuL kidandhu – uragam means snake and uravudaiya nIr would refer to ocean having snake. Here reference to snake implies all the wild species in the ocean. Alternatively uram also means midukku which is strength. Here it would refer to ocean which is deep. You were reclining on such thiruppARkadal (milky ocean). nErA nisAsarar mEl – even during the time that you were resting, reclining on thiruppARkadal, you powdered to pieces the demons madhu and kataibha with your divine disc, when they came as enemies. What sort of activities have you indulged in – killing demons even when you were resting, holding the mountain which would have pained your shoulders, killing the well grown bulls risking your divine form! Thus, when his followers face trouble from their enemies, instead of killing them through his sankalp (will), emperumAn comes in person and removes their hurdles, suffering pain to his divine form. We shall move on to the 84th pAsuram next. This entry was posted in iyaRpA, mudhal thiruvandhAdhi on September 1, 2017 by T N Krishnan.